A chevron butterflyfish works a stand of table coral on the GBR. NEWS ABOUT AUSTRALIA’S GREAT BARRIER REEF is usually dire, but a team of scientists studying the reef have found a ray of hope: Some GBR sections are resilient segments that are in position to support regeneration of damaged areas. ROBUST SOURCE REEFS Far from being a monolith, the GBR is composed of more than 3,800 interconnected reefs. About 100 of them are capable of functioning as “robust source reefs” that can produce coral larvae likely to replenish ailing corals in the system, says marine biologist Karlo Hock of the University of Queensland and his team. They published their analysis, “Connectivity and systemic resilience of the Great Barrier Reef,” in the online journal PLOS Biology. 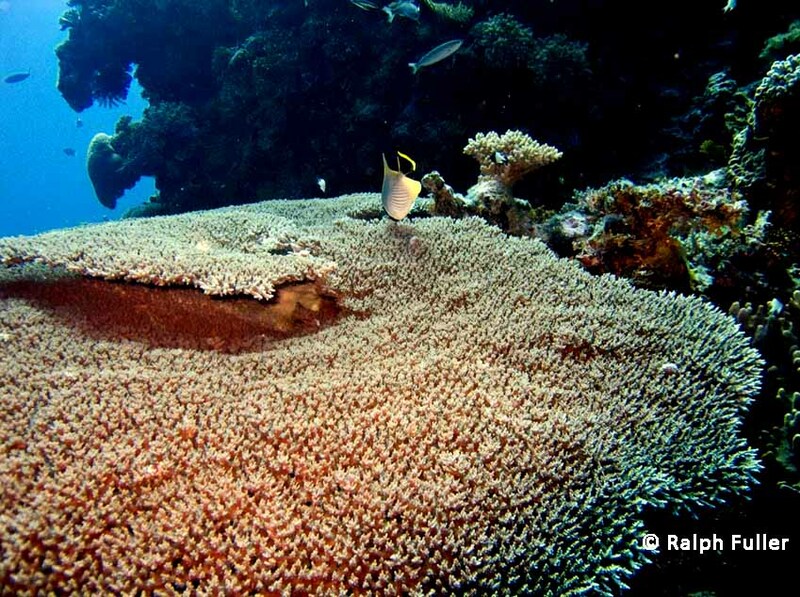 MULTIPLE THREATS Corals on much of the GBR have experienced extensive damage from cyclones, coral bleaching and population explosions of coral-eating crown-of-thorns sea stars (COTS). By correlating reef sections for their connectivity by currents and their history vis-a-vis coral bleaching and COTS attacks, the scientists were able to identify some 100 areas as “robust source reefs.” Image courtesy of PLOS BIOLOGY and the study’s authors. But Hock’s team analyzed reefs in terms of location, connection to other reef segments by ocean currents and a low risk of disturbances like COTS attacks and found some 100 healthy reefs, likely to escape destructive events and whose larvae likely to be transported by currents to other sections. SOUTHERN SECTIONS BEST-POSTIONED Although potential robust source reefs are located along the entire GBR, a distinct cluster is located in the reef’s southern regions, implying that “the southern GBR is likely to be exceptionally resilient and also positioned to stimulate recovery,” the researchers say. POSSIBLE TOLERANCE TO LIMITED WARMING This is a reference to Climate change disables coral bleaching protection on the Great Barrier Reef, a study focused on coral bleaching published in Science Magazine in 2016 by a different team that suggested that many thermal events subject corals to warmer temperatures short of causing coral bleaching, and that those increases may confer a tolerance to warmer water. But they added that increases of as much as half a degree Centigrade may result in that protective mechanism being lost.